Sometimes you just need glitter. I just needed glitter today. Some really bright glitter. Luckily, Trelly's MISC Polish answered that call with not one, but two glitters. Reminiscent of Connect the Dots, these two glitters contain different shapes, sizes and colors. Bars, hexagons and itty bitties are in these two polishes, called Love Always Shines and Sunset Boat Ride. 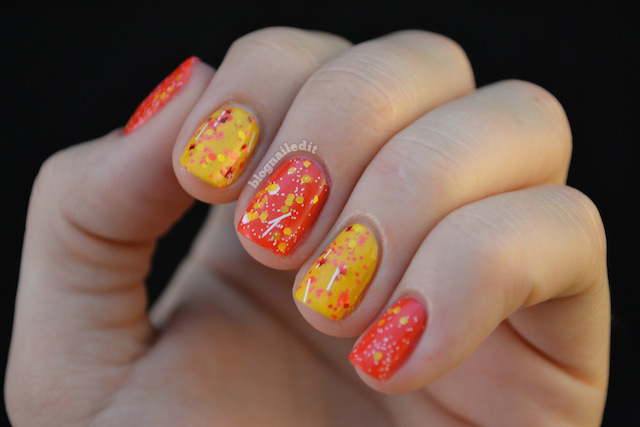 Love Always Shines is the yellow glitter, shown here layered over Tasmanian Devil Made Me Do It (OPI). It's not quite a gold glitter, just a metallic yellow, which is beautiful. Sunset Boat Ride is the red glitter, layered over The "It" Color (OPI). These inspired colors were both welcome additions to my collection, and their creator, Cassie is a true sweetheart. She mislabeled my Etsy order as shipped before they had actually shipped, and then contacted me not only to alert me of the tiny mistake, but also to offer a coupon code for future purchases. I was so pleased and really surprised! It would have only been a two day discrepancy I would have never noticed, but her honesty was touching and inspirational, especially in the face of bad behavior seen in nail world lately. I love this! Been lemming her polishes since i first saw em! These are beautiful. I've been wanting some of her polishes, and this made me pull the trigger and buy lol. These look great! Aw Cassie seems awesome! Wow, great call to the lady that mixed up these glitters, they look amazing! your always using beautiful glitters! I love the color combo of these - it's so pretty!